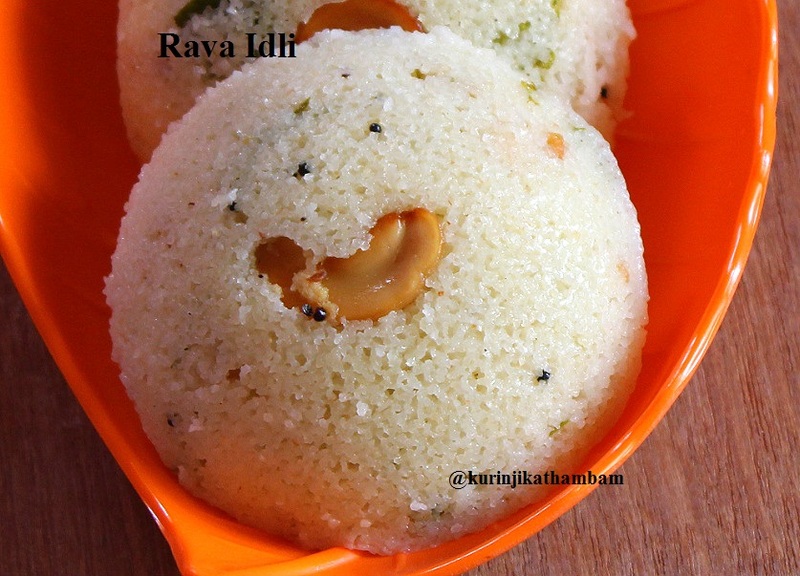 The good thing about Rava Idli is that it can be prepared instantaneously. 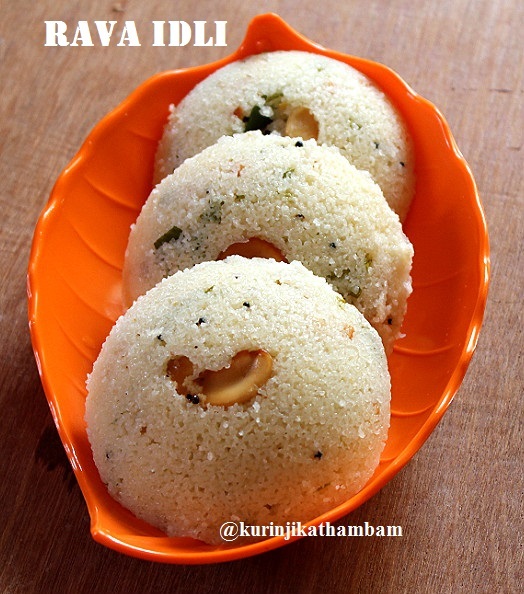 It requires just rava and curd; when served with spicy chutney like milagai chutney; it tastes great. 1. Dry roast the rava till it becomes hot and allow it to cool down. 2. Mix curd and salt with whisk. 3. After the rava cold, mix the rava with curd mixture and keep it aside for 15-30 mins. 4. Meanwhile, heat the oil in a pan, add mustard seeds and wait for popping. Then add the urad dal, channa dal and curry leaves. Sauté for few seconds. 5. Then add the finely chopped green chillies and fry till they become crisp. 6. Pour this temper to the rava-curd mixture, mix them well. Now mix the chopped coriander leaves with this batter. 7. Add the eno fruit salt 5 mins before you make idly. Mix them well and just keep it aside for 5 mins. Now the batter becomes forthy and ready to make idli. 8. Now heat the ghee in a pan and fry the cashews till they become golden in color. Keep it aside. 9. 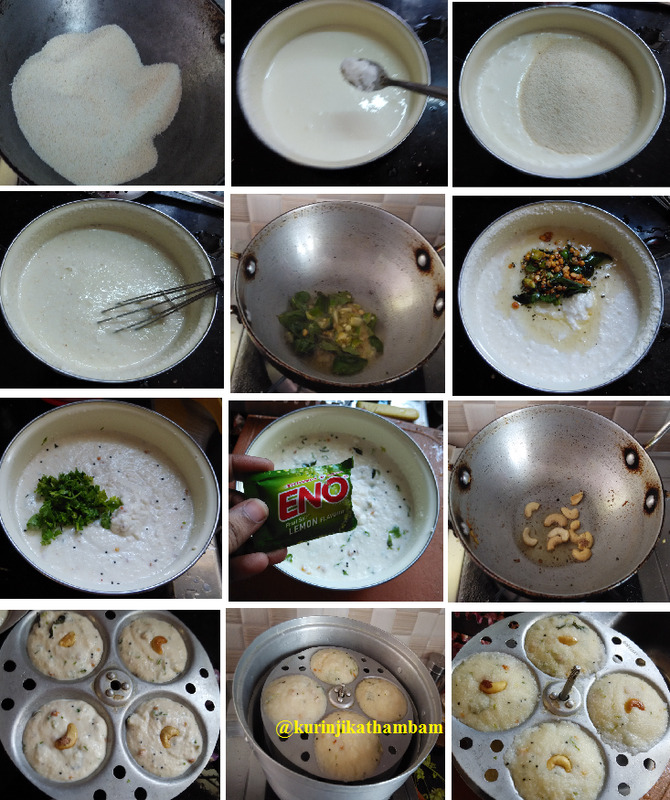 Grease the idli plate with oil, either place the cashews on the greased plate and pour ladle full of rava idli batter, or pour the batter and place the cashews then steam cook for 13-15 mins. 10. After 15 mins remove from the flame and leave it for few mins or apply water to the rare side of the plate. 11. Using the spoon, scoop out the idlies from the plate. Serve it hot with coriander-coconutchutney and milagai chutney. 1. The batter will be little bit thicker than the normal idli batter. 2. No need to add water or more curd than mentioned. இனிய பொங்கல் நல் வாழ்த்துக்கள் !!! 30 Minutes Palak Paneer – Perfect as ‘Fakeaway’ for Friday Nights!